Wireworks were established on this site during the 16thC; the site was still metal working until 1895 and is a significant site on a national basis. It was part of the sequence of sites that stretched from the head of the Angidy Valley to the tidal dock near Abbey Mill. 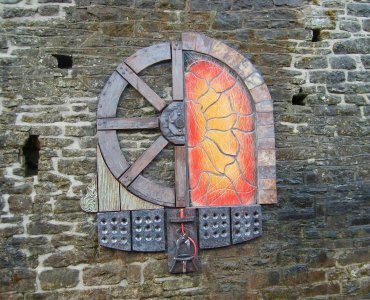 It was the largest industrial complex in Wales in the 1600s, there was a large building with four waterwheels used to power machinery here. There are few surface remains. The retaining wall to the site shows evidence of having been incorporated into other structures that have now gone. The underground chamber located within the fenced area houses the remains of a later turbine within what appears to be an adapted earlier wheel pit. Remains of structures can be seen along the edge of the Angidy River. There are likely to be remains of structures on the site, as evidenced by the structures visible along the edge of the river and in the underground chamber. However, two small trial trenches excavated to 1.50 metres deep, prior to digging a soak away trench failed to reveal any structural remains. In the area where the trench was dug the levels of the site have been made up with rubble and tarmac. •	Widening the access splay to the road and blocking access from the residential end. Minor changes were made to the highway including speed regulators to slow traffic approaching the access, and adjustments to the pedestrian walk way by the George Hotel. •	The long retaining wall supporting the road was surface repointed and rebuilt in sections where deeply rooted trees had caused structural damage to the walls. However there was no structural survey of the wall to ascertain its long term structural capacity. •	Interpretation panels were provided on the site, some are made up of a ceramic art installation created by Ned Heywood. •	A leaflet was also produced describing the Angidy Trail walk (a circular route) linking the industrial remains in the Angidy Valley, including Lower Wireworks with Abbey Tintern Furnace, Tintern Limekilns, Tintern Abbey and Abbey Mill.